Fremont, California, USA, October 12, 2010 - Patriot Memory, a global pioneer in high-performance memory, NAND flash and computer peripheral solutions, today announced the immediate availability of 1333MHz SODIMM memory modules qualified for use in the latest Apple iMac computer systems. The newest Patriot Signature Line for Apple modules are offered in 2GB and 4GB modules and 4GB and 8GB kits at 1333MHz CL9. 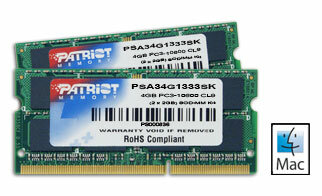 Patriot’s Signature Line of DDR3 PC3-10666 (1333MHz) SODIMMs for Apple computer systems delivers the quality, reliability and performance that makes them the perfect memory upgrade solution. These modules are qualified on the latest product lineup of 21.5” and 27” iMac systems using the Intel® Core i3, Core i5 and Core i7 processors. These latest iMac computers are the first systems from Apple to use hi-speed 1333MHz SODIMMs. Patriot Signature Line 1333MHz SODIMMs for Apple are available immediately from Patriot’s world wide channel of authorized distributors, resellers and partners. Apple and iMac are trademarks of Apple Inc, registered in the U.S. and other countries. For more information on the Patriot Signature Line 1333MHz SODIMMs for Apple computer systems, please visit the product page here.